This Stauros Tungsten Ring with Crosses is one of our newest ring designs to our exclusive collection of Religious Tungsten rings. 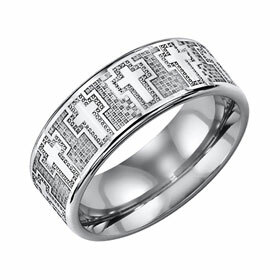 Fantastic design of crosses go all the way around the ring to show the uniqueness of this style no matter where you are. This tungsten ring as well as all of the tungsten rings we sell comes with a black velvet box and FREE Shipping! Was this answer helpful? 34 of 37 Customer(s) found this Answer helpful. Q: My wife is allergic to some metals, is the tungsten hypo-allergenic? Q: will it rust or tarnish? A: Hi David, No, it will not. That is another great thing about Tungsten, this ring (along with every other tungsten ring we sell) will never rust, tarnish or scratch! Hope this helps! Was this answer helpful? 15 of 18 Customer(s) found this Answer helpful. Q: Can I get this ring in size 19? Yes you can. Order the largest we have in stock and in the comments at checkout, write that you want a size 19. It will take two weeks to ship, since they are not in stock right now. Hope this helps! Q: How do you determine the size you need? A: Go to any jeweler and ask to have your figure ring sized. Q: can they be custom sized at our jewelers? A: Tungsten Rings can not be resized due to how strong the metal is. You can always send the ring back to us to have it exchanged for a new size. (As long as it is not engraved.) Hope this helps! Q: Does this item come in GOLD? Was this answer helpful? 11 of 15 Customer(s) found this Answer helpful. Q: Sale ends today. If I order tomorrow will I still get the sale price as the person for whom I want it is not available right now for measurement of the ring finger? A: YES, I see the stamp, need good lighting to see it. It says Tungsten Carbide. Ring texture is nice and smooth, design is nice too. I received my Tungsten crosses ring and it is beautiful. I had one misgiving and that is I had to send it back for resizing. My fault. and if you view the ring upside down you will see the chalice (my opinion) thus my cup run runneth over.But in May,2015 while moving inventory at work, my ring fell off and did not notice it until that night.Searched all over work and could not find it.When I told my wife she knew I was just sick.That ring meant more to me and I was lost without it.But when I saw your ad and price offer,I thought it was too good to be true.You gave me back my prized possession.Prayers answered.Thank you so much. My honey loves his ring it was exactly what he wanted !!! Excellent service and prompt shipping. The ring is absolutely gorgeous. The crosses are muted, but visible enough to see the elegance of the design. This is the second ring I have purchased from this vendor and will continue to do so. Will definitely refer to others. These rings are one of a kind. I could not be happier with my ring. I would give it 5 stars. I have smaller fingers, number wedding ring finger is a 5.5. I was initially concerned about the 8mm width, fits perfectly even with small fingers. Great quality as always. The ring itself is of high quality, but the (beautiful) design is barely visible unless there is bright light on it (as is shown on the website). Just received the cross ring I ordered for my husband and was so excited to give it to him! He absolutely loved the ring. Very happy with the purchase!! Ring seems to be very well made. Engraving is well done. My only wish would be that there were a bit more contrast between the engraved areas and the bare metal areas of the ring. I recently purchased this ring as I wanted a visible symbol of faith. I'm so pleased with this ring. I'd read another review where the customer noted the chalice-like symbols between the crosses. "My cup runneth over," indeed. One of the most worthwhile jewelry purchases I've ever made. Ordered for a friend who is a missionary priest. He was delighted by it. Wears it daily. I want to thank Tungsten Fashions for following through on this ring as it is replacing my wedding band. It is a beautiful ring that does the job very well. Thanks Damien.